I'm so honored to be added to the list of prestigious wedding vendors listed on Style Me Pretty's Little Black Book. As anyone in the wedding industry or in the midst of planning their own wedding knows, Style Me Pretty is pretty much the go to resource guide. 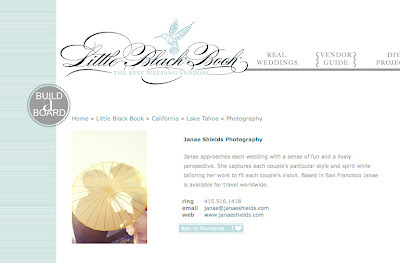 With gorgeous images of Real Weddings and helpful tips this is the place to be for brides and vendors alike. Thanks Abby for including me!